This was a homework assignment for a class on Designing Accessible Websites. I describe my experiences interacting with the Web while simulating different disabilities. 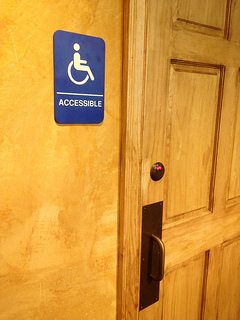 I’ve been interested in accessibility issues for many years. I have had a few different friends with all sorts of disabilities, and I have been a volunteer and student worker in the Disabled Students Programs and Services (DSPS) office. Most of my experiences have been with the blind. One of my friends had an acquired brain injury (ABI) following a traffic accident. As a result of these experiences, I have taken a keen interest in making my Websites as accessible as possible. I actually tried all four of the experiences (a. using my computer without a mouse, b. using a screen reader to browse the Web, c. using the low vision simulator, and d. using a color blindness simulator). I’ll give you a few thoughts about each below. Describe in detail your experiences while trying to access the Web with a simulated disability. a. I have worked on computers, both setting them up and fixing them when they break down, for several years. I have had to use computers without working mice, and even try to use the Web to download drivers to get them working again. It never was a fun experience. You really have to be something of a “power user” to use a computer without a mouse–you need to be able to remember dozens of keystroke combinations (alt-tab to switch between windows, alt-W or alt-F4 to close, alt-D to get to the address bar in the browser, etc. ), and you must have good eyesight to see the sometimes subtle ways that controls (checkboxes, scroll bars, text areas) change to indicate that they have focus when you finally manage to select them. b. One of my friends who is blind has the program JAWS installed on his computer. JAWS is a screen reader program that reads a Web page to the listener, helping them to understand what is on the screen. Naturally, I was curious to “see” how my personal Website sounded in JAWS. At the time, I had spent a lot of time handcrafting my Website, rather than using a content management system (CMS), so I had built-in some accessibility features that should have made the site more usable. The site turned out to be a failure, however, and we gave up on it before reaching the bottom of the second page. c. I tried the low vision simulator, and it really struck home. My grandmother suffers from macular degeneration, and another elderly friend of mine suffered from blindness related to peripheral neuropathy. My father had suffered from cataracts and glaucoma-related blindness in his left eye for several months, maybe even a year, before he passed away in June. My grandmother does not use computers, but my friend and my father both did, and I had to help them adapt their computers so that the could continue to using them despite their limitations. d. In almost every place I’ve worked in, there has been someone who was color blind. I always was happy to find them, because I would ask them to look at the company’s Website and make suggestions for making it easier to use. I use a color blindness simulator in my browser to help me see how things might look to a color blind person, but nothing compares to having interaction with someone who is color blind giving real-time feedback on the site. Discuss one or more challenges that you experienced while accessing the Web in this way. a. Beyond having to memorize lots of keyboard shortcuts just to use a computer without a Mouse (and remembering the subtle differences between Windows, Mac, and Linux), the whole process is slow, frustrating, and difficult. First, it takes a long time to get to where you want to be on the Web page. The tab key is the fastest way to get directly to a link you want to “click” on, but if there is a lot of text on the page, and very few links (like this one), tabbing between links will cause you to miss a lot of text. Arrow keys can make it pretty easy to move up and down the page, and I use that feature all the time on my laptop. Several sites (probably thinking they are being helpful) change the focus to a control on the page (like a search box or a text area), making it difficult or impossible to use the arrow keys to scroll the screen properly. Several Websites disable certain functionality (like the disabling the alternate-click menu or disabling printing) thinking that they are preventing users from stealing their content, but all they are doing is making their sites less accessible. Even on this course’s Desire 2 Learn (D2L) site, right-click and printing are disabled during quizzes, which makes it difficult to view the quiz in printed form. This is a false sense of security, because (with some effort) it’s still possible to get a printout, so why make it more difficult for people who already have difficulty using computers? Some sites, especially those that use Flash, Shockwave, Silverlight, or Java, are completely useless without a mouse. Most games (puzzles, arcade type, etc.) are impossible to use without a mouse. The point is, that sometimes inadvertently, and sometimes deliberately, Website designers change the way that Web browsers normally work, and that almost always ends up making the site more difficult–if not impossible–to use for many people, even those who do not have a disability. c. As I mentioned above, blocking printing or saving of Web pages can severely interfere with the workflow of disabled users. My friend with neuropathy had great difficulty reading things on the screen. She had to mostly use her peripheral vision to try to identify things by shape and position, but actually reading text was nearly impossible (she was mostly deaf, too, so a screen reader was no help). Her solution was to print everything out and view the printout on her enlarging viewer. An enlarging viewer uses a video camera to project an enlarged close-up view of a printed page, book, or newspaper onto a large display screen. She would never be able to take a quiz on the course’s Desire 2 Learn (D2L) site, since she would not be able to print it. Instead, she would have to rely upon someone else to read her the questions and fill in the form. Since she had to pay her helpers, that is an added cost that can quickly add up. In my dad’s case, he did not have an enlarging viewer, so sometimes he would save pages to his computer, and then use another program (like Word or Acrobat) to adjust the size to something more readable. More often, he would copy things from the Web and paste them into Word. Or, for videos, he would right-click and save them to his computer to view them in his preferred media player at full-screen size. Blocking users from doing things they need to do to use a Website does not prevent someone who is determined from doing it anyway. All it does it make it difficult (if not impossible) for those who rely on doing those things to make the Web adapt to them. d. Of all the disabilities, I think that color blindness is the trickiest and most subtle to deal with. It is tricky because there are different types of color blindness, even taking one type of color blindness into account, there may still be problems for people with another type. The subtlety come in because if there is any exclusive reliance on color differences, those differences might be completely invisible to the site visitor. Some text may completely disappear, subtle but important details in an image or chart might be invisible, and things that are obvious to a color-normal visitor may be overlooked by the color blind. Any additional reflections on your experience? I basically included my reflections with my comments above. So, here are some of the tools that I use to help to try to make my sites more accessible. Web Developer toolbar is the most useful, can’t-do-without-it item in my collection. It has dozens of tools for tweaking the browser to identify problems, disable styles, disable scripts, validate your HTML and CSS, and check your Website for accessibility issues. If you prefer Mozilla Firefox browser, there’s a Firefox version available, too. Pendule is very similar to Web Developer, with slightly different options. Chrome Daltonize to simulate several types of color blindness. ChromeLite was an April Fool’s Day joke, but it works well as a pseudo-text-only Web browser for identifying accessibility problems. ChromeShades is another took for helping to spot accessibility problems. ChromeVox is a free screenreader for Chrome that works much like JAWS or ThunderStorm, by reading Webpages to you, though it has a bit of a learning curve to use it well. Clearly removes all the formatting from a page and displays the readable text; good for checking that all your important text is accessible. ColorZilla is not an accessibility tool, but it makes picking contrasting colors easier. Firebug Lite for Google Chrome helps advanced Web designers track down issues with Webpages. Grayscale removes all the color from a Webpage, making it easier to tell if there are any contrast issues. High Contrast is not so much a Web development tool, but rather a tool to increase contrast on pages; it can be interesting to view your own sites with this tool for a different perspective. Palette for Chrome, like ColorZilla, is not an accessibility tool, but it makes coordinating color palettes, like the swatchs you might find in a paint store, which can help to avoid contrast and color blindness issues. It can be a bit of a pain making your Website truly accessible (and it’s really more of an ongoing process than a one-time effort), but it is extremely satisfying watching someone with a disability be able to use the Web as effectively as someone without.